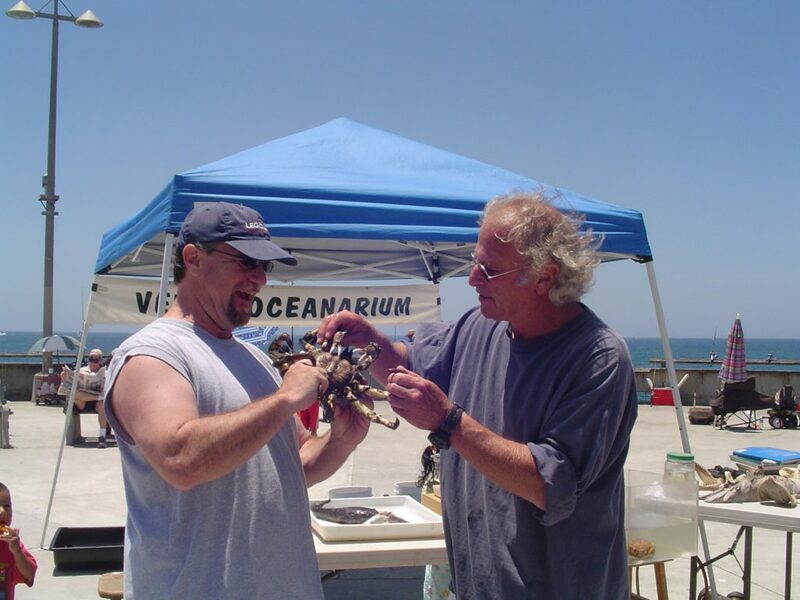 Tim Rudnick’s Venice Oceanarium, located on the Venice pier at the end of Washington Blvd., brings to light the underwater wonders of Venice Beach. With the pier as a platform and the ocean as a backdrop it is an ideal site to set up marine displays and to showcase the unusual catch of the day from local fisherman. One time there were three baby leopard sharks caught! Do you know the difference between fish and sharks? This is the place for marine aficionados, and especially children, to learn about this and much more. Right now, the displays are more of a biological nature, but plans for the future include more exhibits having to do with the physical properties of the ocean like temperature, PH and wind velocity. “Wind is an interesting part of the beach that’s hardly ever thought of,” says Tim. Also included for the future is a telescope for night shows. “The pier is a good place if it isn’t foggy to see the stars,” he adds. You will learn that a fish has bones and a soft skin of scales while a shark has a skeleton of cartilage and tough skin covered with small tooth-like scales. Both are part of the exhibit. “People catch so many sharks on the pier that is relevant to show different types,” says Tim. Every once in a while, a deep-water fish will be caught off the pier such as the “Midshipman.” This genus has a series of little bioluminescent dots on the belly which look like the buttons on a naval uniform. Hence the name. “We think they come into shallow water for mating,” says Tim. Marine organisms are divided into three major ecological groups. Plankton are minute and generally have no locomotive organs and drift with the currents. They are the first link in the marine food chain. Minnows would be an example. Nekton can propel themselves independent of the currents. They are fish, sharks, and whales. Benthic either walk or are attached to the bottom of the sea such as oysters and clams. A net is hung over the side of the pier to catch these organisms for display purposes. A microscope is available to look at the small forms. “We look under the microscope so people can understand what plankton is,” says Tim. Also interesting is looking at acorn barnacles to see the legs opening and closing filtering the water in search of plankton. Tim has lived in Venice since the 1960s and only swam in the water several times a year for the first 15 years. It took a vacation to get him interested in marine life. Since then, it has become his passion. His enthusiasm is contagious! He loves to impart his knowledge to others, especially children. Who knows – he may inspire a future marine biologist. Right now, the exhibit is scheduled every Sunday from noon to 3:00 pm until Labor Day weekend. Plans are in the works to keep it there on a permanent basis. Volunteers are needed to man the booth. For information, call 310-500-5941.